Instagram has today released version 7.5 of its famed app for mobile, which brings with it support for portrait and landscape photos and videos, giving users more freedom when it comes to snapping and uploading images to the social network. Up till now since Instagram’s inception, users had to make do with square format images on the social network, and anything with a different aspect ratio required the image to be cropped or edited before it could be posted online. 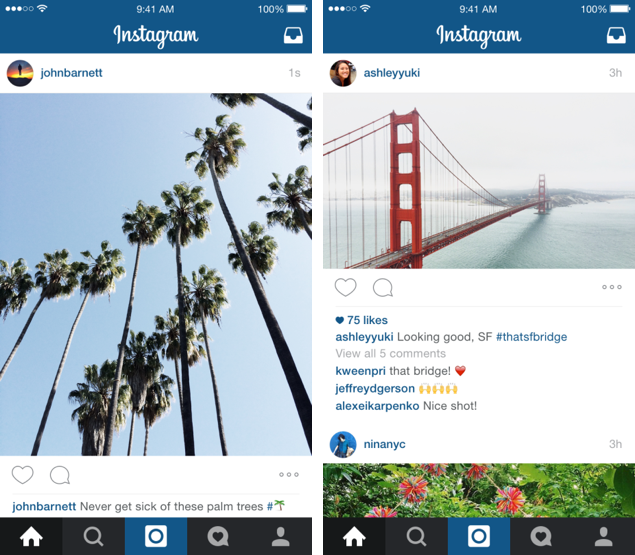 But all of that changes today with the release of Instagram 7.5 for both iPhone and Android. Support for portrait and landscape photos is something which many users had been crying out loud for a long time, and today, Instagram has eventually delivered what the public had been waiting for. Interestingly, Instagram hasn’t done a half-baked job here, and has even added support for landscape and portrait videos as well, so you can rest assured that all the bases are covered from the get go. It turns out that nearly one in five photos or videos people post aren’t in the square format, and we know that it hasn’t been easy to share this type of content on Instagram: friends get cut out of group shots, the subject of your video feels cramped and you can’t capture the Golden Gate Bridge from end to end. Now, when choosing a photo or video, you can tap the format icon to adjust the orientation to portrait or landscape instead of square. From that paragraph alone it should become clear that the Facebook owned company has been keeping a close eye on what is being posted to its social network for a long time. And with Instagram having delivered on what the community had been asking for, it’ll no doubt open a new chapter to how we snap and share filtered images with our friends and family online. The new and updated Instagram app is available to download today, and as ever, it’s absolutely free and has no hidden in-app purchases whatsoever. iPhone users can download the update from here, whereas Android users can grab the software from here. If you already have the app installed on your device, then be sure to grab the update from the App Store or Play Store right away. Be sure to let us know in the comments section what you think about the update and how it will change the way you take photos.